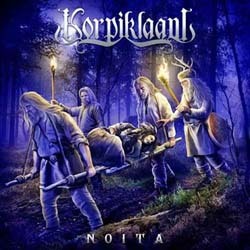 In anticipation of their upcoming new record, Finnish folk metallers Korpiklaani have revealed the cover artwork of “Noita“. It is by Jan Yrlund from Darkgrove Design, who has created all Korpiklaani covers in recent years and once again has come up with another masterpiece. “Noita” has been recorded at Petrax Studio with Aksu Hanttu handling production, recording and mixing again. It will also be the first album of the band to feature the new accordion player Sami Perttula, who has been added another dimension in the folk arrangements along with fiddler Tuomas Rounakari. In March 2015, Korpiklaani will be headlining the Paganfest Extended Shows and will additionally play a run of European festival later this year. You can check their official pages for all live dates. “Noita“, which will be out on May 01, 2015 (EU), May 04, 2015 (UK) and May 05, 2015 (US) via Nuclear Blast, is already available for pre-order in their label’s web-shop.